Universal FineFiber Mat Pads grip the floor and absorb oils, coolants, solvents and water where you walk to keep floors dry and safe. Top and bottom layers of FineFiber are built of densely-woven, small-diameter strands of fiber to increase surface area enabling the Mat to grip the floor and secure it for safer walking. Universal application for oil, coolants, solvents and water. FineFiber Mat has a layer of MeltBlown polypropylene ultrasonically sandwiched between two FineFiber layers. Sonic-bonded "Dimples" add fast-wicking power and strength. 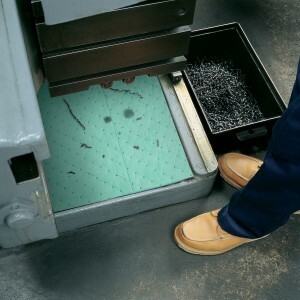 3-ply construction gives Mat durability to resist heavy foot traffic for longer wear and fewer changeouts. Large-diameter MeltBlown polypropylene fibers create a high-loft inner layer that absorbs high volumes of liquid fast. HeavyWeight construction offers the greatest sorbency. Color-coding helps you visually identify the right sorbent for your needs. Green signifies Universal sorbency and fits into many professional surroundings.